Although things have been a little quiet at the feeders some of our winter visitors will soon begin to appear at feeding stations. This is the time when I begin ground feeding more. Birds like Juncos, White-throated sparrows, White-crowned sparrows, and Fox sparrows start to quietly sneak into the picture below feeders and near areas of good cover like the brush piles I’ve created. 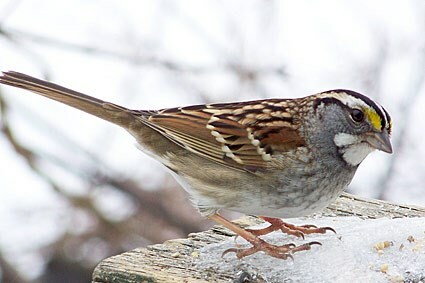 This handsome group of little birds likes white millet on the ground. Sometimes you have to look closely to see them as they can blend into the leaves. Other birds we look forward to seeing are Pine siskins and Purple finch, which may be seen in good numbers at finch and sunflower feeders. Pine siskins and Purple finch are here practically every winter but their numbers may vary greatly. Pine siskins may go unnoticed at finch feeders, blending in with the Goldfinches in their dull winter plumage. Siskins are the size of a Goldfinch and their plumage is described as heavily streaked with a touch of yellow in the wings and base of the tail. Listen for the buzzy “shreeee” sound Siskins make. A flock of siskins may sound like bacon frying. Goldfinches have slowly been returning to my feeders this week, although at first they were almost imperceptible because of their lack of color. Purple Finch on the left. House Finch on the right. Purple finches are often confused with House finches. While we see House finches year round at our feeders Purple finch are typically here only in the late fall and winter months. 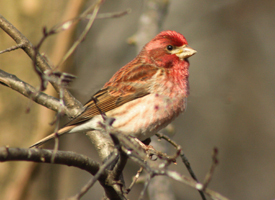 The male Purple finch has a more raspberry red color that is most prominent on the chest, head and rump. The head of the Purple finch is slightly crowned too. Suet feeders often produce some of the best surprises of the winter. Golden and Ruby crowned kinglets will visit suet, as will the Yellow-bellied sapsucker and Red breasted nuthatch, Yellow-rumped and Orange crowned warblers, and Bluebirds and Brown Creepers. You may have noticed a lack of Goldfinches at your feeders. This is normal for this time of year. Read our post on “where did all the Goldfinches go”. And every winter there are a few folks that will enjoy an overwintering hummingbird, like the Rufous, Anna’s, or even Black-chinned hummingbird. If you see a hummingbird in the month of November or December please give us a call. As always, a consistent supply of water is a great way to attract birds, especially in the winter. Birdbath de-icers are now in stock. Sign up for our e-mail list and receive local bird news and store specials. We respect your privacy and send out only one - two e-mails a week.